Climate change affects every human around the globe, with profound implications for social justice and human rights. Health-related stresses, competition for natural resources, and the impacts on livelihoods, hunger, and migration warrant immediate global action. This paper explores a relatively new and developing topic for business: the intersection between climate change and women’s empowerment. It uses compelling data, a clear business case, and company case studies to strengthen corporate understanding of the connection between women’s empowerment and resilience to climate change impacts and to drive corporate action to put women at the center of climate-resilience solutions. 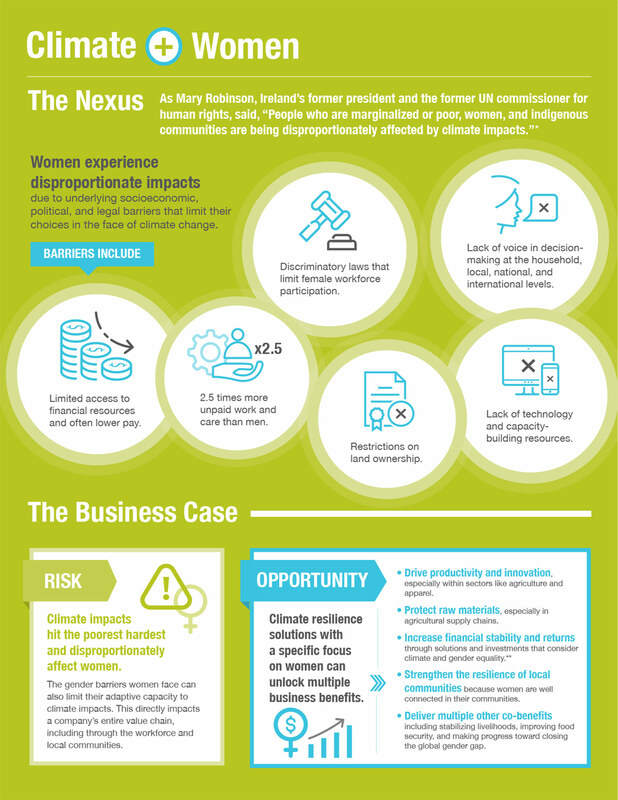 Ultimately, this paper aims to help companies prepare for the consequences of climate change and address material business risks, while simultaneously embracing opportunities that benefit business, women, and communities. This report is part of a series of six climate nexus reports that cover human rights, inclusive economy, women’s empowerment, supply chain, just transition, and health. Women experience disproportionate impacts due to underlying socioeconomic, political, and legal barriers that limit their choices in the face of climate change. Limited access to financial resources and often lower pay. 2.5 times more unpaid work and care than men. Discriminatory laws that limit female workforce participation. Lack of voice in decision- making at the household, local, national, and international levels. Lack of technology and capacity-building resources. Climate impacts hit the poorest hardest and disproportionately affect women. The gender barriers women face can also limit their adaptive capacity to climate impacts. This directly impacts a company’s entire value chain, including through the workforce and local communities. Climate resilience solutions with a specific focus on women can unlock multiple business benefits. Drive productivity and innovation, especially within sectors like agriculture and apparel. Protect raw materials, especially in agricultural supply chains. Increase financial stability and returns through solutions and investments that consider climate and gender equality. Strengthen the resilience of local communities because women are well connected in their communities. Deliver multiple other co-benefits including stabilizing livelihoods, improving food security, and making progress toward closing the global gender gap. 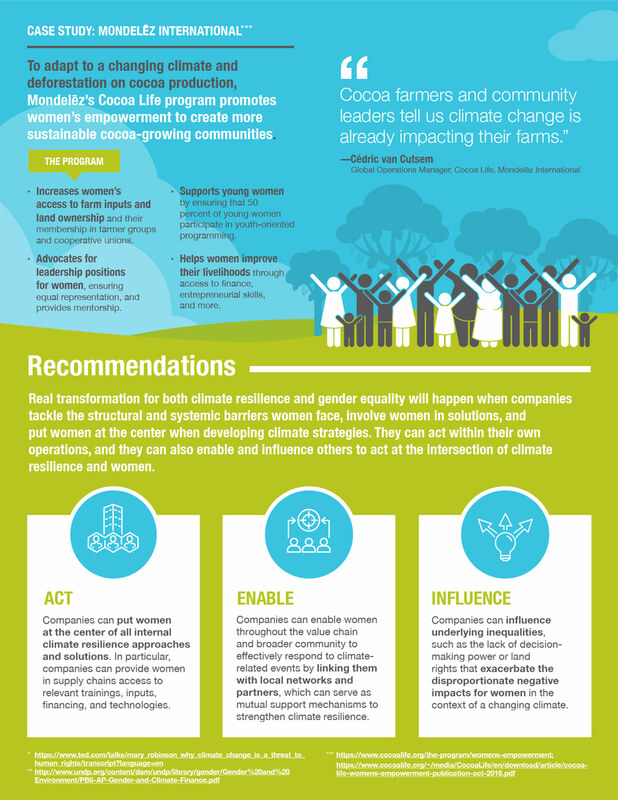 To adapt to a changing climate and deforestation on cocoa production, Mondelēz’s Cocoa Life program promotes women’s empowerment to create more sustainable cocoa-growing communities. Increases women’s access to farm inputs and land ownership and their membership in farmer groups and cooperative unions. Advocates for leadership positions for women, ensuring equal representation, and provides mentorship. Supports young women by ensuring that 50 percent of young women participate in youth-oriented programming. Helps women improve their livelihoods through access to finance, entrepreneurial skills, and more. Real transformation for both climate resilience and gender equality will happen when companies tackle the structural and systemic barriers women face, involve women in solutions, and put women at the center when developing climate strategies. They can act within their own operations, and they can also enable and influence others to act at the intersection of climate resilience and women. Companies can put women at the center of all internal climate resilience approaches and solutions. In particular, companies can provide women in supply chains access to relevant trainings, inputs, financing, and technologies. Companies can enable women throughout the value chain and broader community to effectively respond to climate-related events by linking them with local networks and partners, which can serve as mutual support mechanisms to strengthen climate resilience. Companies can influence underlying inequalities, such as the lack of decision-making power or land rights that exacerbate the disproportionate negative impacts for women in the context of a changing climate.